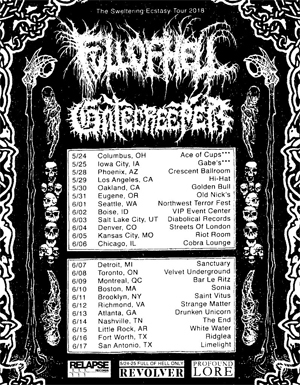 Relapse label-mates FULL OF HELL and GATECREEPER have joined forces for a co-headlining North American Summer Tour. Presented by Revolver Magazine, The Sweltering Ecstasy Tour kicks off on May 24 in Columbus, OH while GATECREEPER joins on May 28 in Phoenix, AZ. The pair will crush skulls together for three weeks, ending on June 17 in San Antonio, TX. A full list of confirmed tour dates is available below. Additionally, FULL OF HELL will tour Europe throughout March/April with IMMOLATION. The trek begins March 15 in Warszawa, PL and ends April 8 in Kasel, DE. The band will also perform an exclusive hometown concert in Baltimore on February 22. GATECREEPER will perform at Modified Ghost Festival III in Vancouver, BC on May 24. Stay tuned for more news on each band in the near future. GATECREEPER’s impending Split LP with IRON REAGAN is due out March 2, 2018 on CD/LP/Digital via Relapse Records. Physical packages are available via Relapse.com and digital downloads via GATECREEPER’s Bandcamp. FULL OF HELL recently signed to Relapse and are currently writing their next full-length. Their full discography is available to stream via Bandcamp.